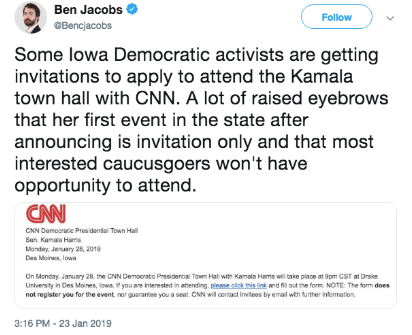 (DES MOINES) – Kamala Harris is set to participate in a CNN Town Hall in Iowa tonight, fresh off announcing her presidential bid. 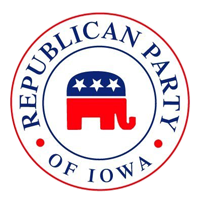 Like Gillibrand and Warren before her, Harris is struggling to find a base as Iowans grow tired of out-of-touch liberals jetting in from the East and West coasts. 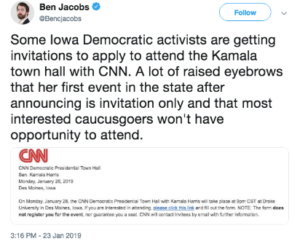 What’s more, she’s filling her first town hall with prescreened Iowans and shutting out interested caucus-goers – not a great strategy for a candidate desperate for more support. In addition, “Harris was criticized in 2010 for withholding information” about a technician who was accused of “stealing drugs from the lab. The author added that Harris “needs to radically break with her past” if she wants people to vote for her.